Maybe Minecraft will be in style again next year. Who knows! 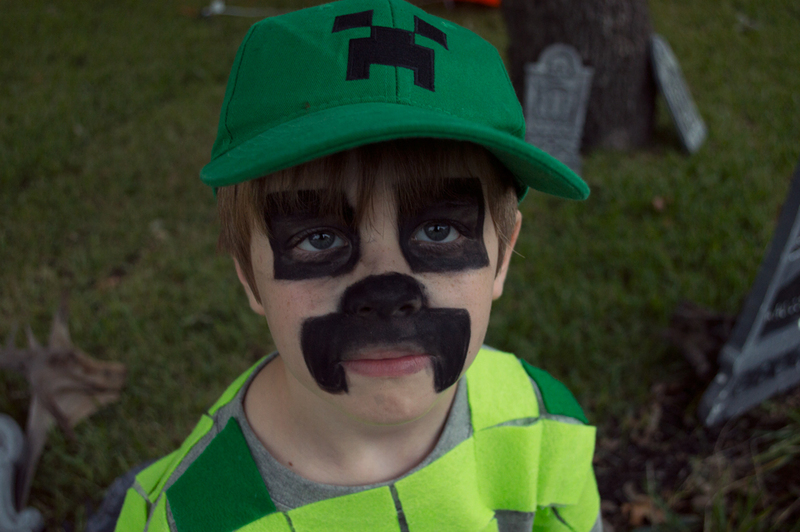 In any case, I decided to post my version of a Creeper costume. I don’t usually post instructions on how to make things because…well…if you lived with me, you’d see why. Anyhow! I imagine this general plan could cover many of the creatures in Minecraft since they are built of blocks. I got this idea from another blogger who has more of a focus on homemade items than I do. This blogger gave some really good advice relating to mistakes to avoid. For one, she underestimated the time it would take to put this item together. Simple concept/tedious execution. I made sure to start this costume well in advance and to use fabric glue and iron-on backing. 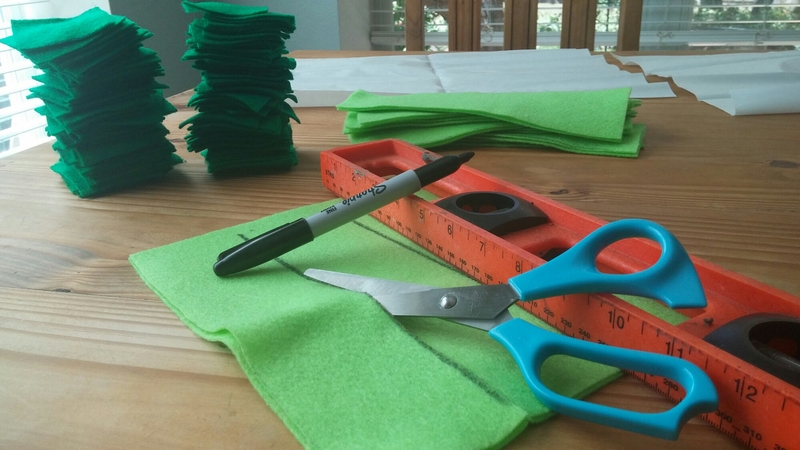 The other blogger used a glue-gun, which isn’t ideal for fabric (but great in a pinch!). The iron-on backing I used did not fare so well during a school day. Some of the felt and the grey sweatshirt material didn’t adhere enough to make it all the way through. I ended up gluing the pieces back on last night with fabric glue. I made sure to glue around the square edges so they would lay flat. I went through the trouble of doing that because the Kid tells me he plans to wear this shirt on other occasions. Um, okay! If I had to do it again, I would have used a good quality fabric glue from square one. Ironing of the pieces made them crooked because they either stuck to the iron or slid around. The shirt looked better when I peeled off the crooked ones and glued them back on straight. ^^^ See how they are kind of crooked? Annoying after all that measuring and cutting. Grr. 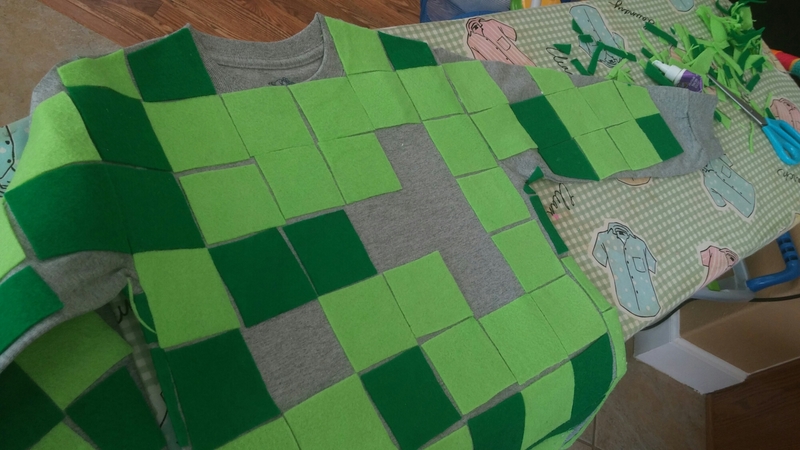 There are a ton of patterns you can download and print for a good Creeper head. It’s still uncomfortably warm and humid most years in Austin, so I opted for makeup instead of a cardboard head. 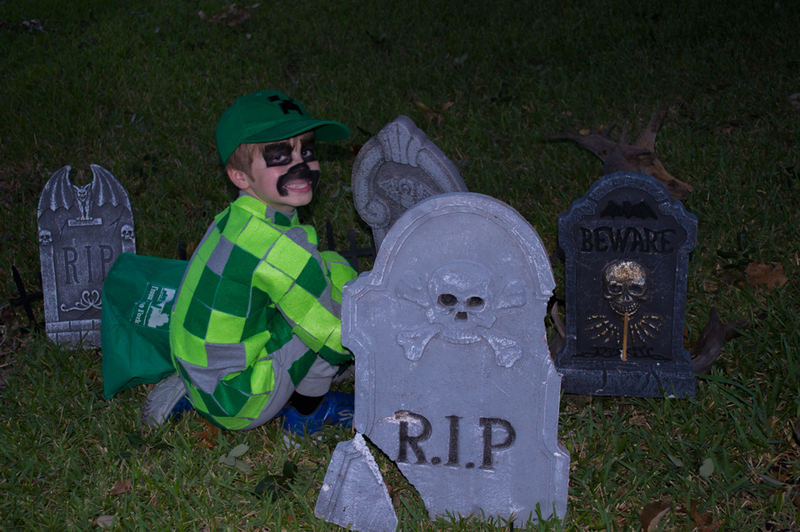 The Kid already owned a Creeper cap, but he got so warm he had to take that off during our trip around the neighborhood.